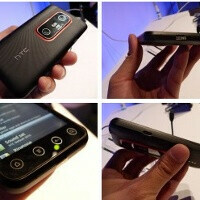 Sprint’s upcoming HTC EVO 3D is one of the most looked upon smartphone launches of this summer, but while it has the dual-core power and 4G connectivity to match the latest flagships, it aims to do more by bringing 3D movies to your pockets. While currently, 3D seems to be more of a gimmick rather than a real advantage, Sprint is offering the phone with some pre-loaded 3D content which might just lure you into a purchase. First of all, watching movies should be a great experience on the 4.3-inch qHD screen of the EVO 3D, but you’ll be tempted to watch even more of them with the pre-loaded rental service HTC Watch. For a limited time, the HTC EVO 3D will ship with the movie "The Green Hornet 3D" pre-loaded, but you could also store up to five movies in HTC’s cloud service. The Blockbuster On Demand application will also come pre-installed on the handset, giving you even wider access to movies. While the choice of 3D films is definitely not mind blowing, some, like "Drive Angry"", will be available with the launch of the EVO 3D. Gameloft has also stepped in to provide some 3D gaming with the pre-loaded demo of the 3D version of Ultimate Spider-Man: Total Mayhem. In addition, the Gameloft Storefront application will come preinstalled. Finally, you’ll be able to upload self-made 3D footage to YouTube, while the QIK application will help you stream videos enhanced with support for the third dimension. While that’s certainly a practical step showing just how you can use 3D, will it be enough to convince you that 3D is more than just an impractical gimmick? Feel free to voice your opinion in the comments below. Wow! That's really cool. I'm gonna get one! But, will all of this stuff be available for the European version? 3d is over rated big time!! Look 3D is not overrated. It looks to be something different that’s all. The HTC Evo 3D can be used in 2D all the time, if that is what the user wants. It's GOOD to have the ability to play a game, watch a movie, take a picture, & take a video in 3D if I choose to. I like having options. I know when I get the HTC Evo 3D I will use the 2D more, but I WILL definitely use the 3D & heck if it proves to NOT be a gimmick then I will be even happier because my phone will be able to it! Other phones can’t say the same. So no one knows if 3D is overrated or not. If the trend is anything like 3D TV's then a lot more manufacturers will start making 3D phones! Look at it this way, the HTC Evo 3D is just like any other high-end 2D phone with the BONUS ability to do everything in 3D also! I think that’s pretty cool! Still? After all I said you still think that? Really? 3D is just new on a phone, you can't overrate something that is still not in the market. If people are willing to buy it then it's not overrated! I remember a time when they said texting was overrated, now everyone & their mothers text. Maybe you mean you don't like 3D? To say it's overrated, how do you justify that comment? What if 3D spreads like a wildfire? Then who knows, it may be a feature on every phone. We still don't know if it's overrated or not! Talk to me in a year by then we will know for sure. This person is only saying this for two reasons. 1st: because they are obviously jealous because they can't have one or get one. 2nd: to drive you nuts because of your first response. I think 3D is pretty awesome on a phone and I might get one. The only thing stopping me is Sprint's network. Crappy cameras? Your an ignorant fool if you think that 5mp makes crappy, but 8mp makes for a damn DSLR. THEY ARE CAMERAS ON CELL PHONES! yes... they are obviously cameras on cell phones, but i think i wud rather have one 8 megapixel than 2 five megapixels... do u not have the capacity to understand that? Your logic is actually flawed, due to the fact that megapixels are not the be-all end-all of camera quality. In fact, a large megapixel count with a small sensor like you find in phones can result in lower image quality. I don't know whether 3D in its current state is a gimmic or not. Personally I'm not that interested in it. However, I would much rather have the option to take 3D images and video in the event that there does end up being an applicable use for the technology than have a few extra megapixels that serve no purpose other than to make my raw image data take up more space. I agree, look at the thickness of the phone. I do not care about 3D in any format. Give me a simple phone that runs smoothly and doesn't require extra girth to fit all the gimmicky goods inside: i.e, the sensation. A 4 in screen with a slender body is all I want! Compare the EVO 3D to Galaxy S and this phone is just too thick. I am looking foward to the HTC Kingdom. It looks like a CDMA version of the Sensation. It's got a bigger battery in it... That's gotta go somewhere, so what if its a bit thicker, most people I've seen have extended batteries in their Evos making them MUCH thicker than the 3D. Actually, it is my understanding that they lengthened the battery rather than thickening it. Hence the loss of the kickstand built into the frame. if you trade in you old evo for the 3d, sprint gives you 150.00 for the trade in. i know since im a rep at sprint. You obviously didnt work for Sprint or like heyitzme said are bitter about getting fired. Sprint's service is great and the EVO is a great phone. No Sprint employee/rep would ever represent themselves or the company in such a negative manner. Take your garbage somewhere else. I have an almost 2 yr old Hero. So the EVO 3D will be a HUGE improvement for me. Not so much for the 3D, but the 4.3" qHD display, 1.2 Ghz Dual-Core, 2.3 OS, and WiMax 4G capability. I'll "play with the 3D a little, but don't like to waste battery life on anything other than calls, messaging, & data. if bringing some new form of multimedia to the smartphone market is overrated than why would anybody buy the newest devices coming out every quarter/year.. its interesting and im getting one. The HTC EVO 3D Dimensions: 5.0" x 2.6" x .48" (LxWxT) The HTC EVO Dimensions: 4.8" x 2.6" x .5" (LxWxT) The 3D is thinner the original EVO.